A community group is to buy two Highland estates after securing the £2.9m price tag with hours to spare. The Glencanisp and Drumrunie Estates in Sutherland and Wester Ross will be sold to the Assynt Foundation after a deal was struck ahead of the sale deadline. The Vestey family agreed to sell the land to the group, comprising about 900 local residents, on Thursday. It will be the first major landholding sold under the community right-to-buy provisions of the Land Reform Act. The Assynt Foundation said it was "elated" with the sale after raising the funds before the deadline. Terms for the formal contract of purchase have been agreed and the date of entry has been provisionally set for 14 June. 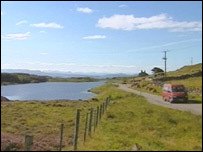 It comes 12 years after Assynt crofters succeeded in buying the 21,000-acre North Lochinver Estate in 1993. Foundation chairman Alistair MacAskill said: "We are elated to be bringing the land into community ownership and creating this opportunity for current and future generations of people in Assynt. "We do not underestimate the challenges from here but we are determined to manage the land for the benefit of the local community and the wider public. "That means we will be changing the way the land is run - it will no longer just be a private sporting estate. "Instead, we will be working to achieve not only economic but also environmental sustainability, and creating jobs and new opportunities for local people through good stewardship." The group was granted the right to buy the estates in December 2004 after the Scottish Executive halted the sale to allow a community application. It raised the money through a number of individuals and groups, including £1.6m from the Scottish Land Fund and £600,000 from Highland and Island Enterprise's (HIE) community land unit. The 44,000-acre estates, which includes the Suilven, Canisp, Cul Mor and Cul Beag mountains, as well as former farm and croft lands, are being sold by Robin and Tim Vestey. The Vestey family said: "We are pleased an agreement has been reached and wish the Assynt Foundation well as it undertakes the significant challenges of large-scale estate ownership and management. "Our family has managed land in the area since the 1930s and will continue to look after the land we are retaining. "Like the Assynt Foundation we are committed to this part of the world." Scottish Land Fund chairman David Campbell said: "The community has done a tremendous job in raising so much over a very short period. "The scale of support from all those involved underlines our joint belief in the Assynt community and its ability to protect and enhance this unique, fragile asset for its own future and for Scotland." The head of HIE's community land unit Andrew Anderson added: "When you consider what the community has achieved in pulling together this amount of money in a relatively short timescale, it demonstrates its drive and commitment to making this work." Deputy Environment and Rural Development Minister Lewis Macdonald also welcomed the deal. He said: "I particularly welcome the transfer of land in Assynt, one of the places where reform of Scotland's land ownership began over 10 years ago. "The Assynt Foundation is to be congratulated on its commitment and determination in raising £2.9m to secure this purchase for the longer term benefit of the people of Assynt and for Scotland as a whole." Scottish National Party Highlands and Islands MSPs Rob Gibson and Jim Mather welcomed the buyout. Mr Gibson said: "This is momentous news, in the early 90s the Assynt crofters started taking back their land and it is wonderful to see the process vastly extended into wild land that the Assynt community can now manage sustainably." Highlands and Islands Green MSP Eleanor Scott has lodged a Scottish parliamentary motion congratulating the residents. She said: "This is an historic day for Scotland and a great boost for the community land movement." Q & A: What will land reform mean for Scotland?